If these came out a year ago, I would have given them a mostly positive but unenthusiastic review. I would have said, "They taste great, but come on... take some time in the morning and make some waffles or something." But something happened recently. I had a baby. There's nothing like a baby to make you realize that finding time for breakfast can be a challenge. I mean like super, incredibly challenging. So as a new father, I enthusiastically endorse this product. I've had them for breakfast. I've had them for lunch. There's been days when I've had nothing but these things. 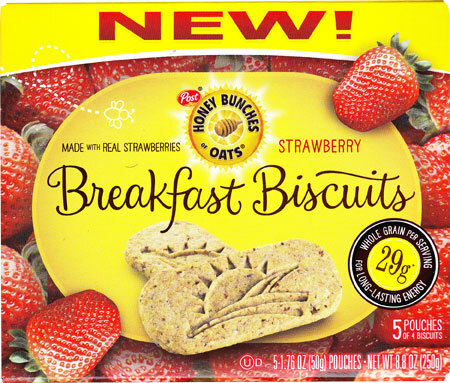 Honey Bunches of Oats Breakfast Biscuits come in small pouches with each pouch holding a serving of 4 biscuits. One serving is quite filling and provides a significant amount of whole grains. I find that one pouch can keep me full for about 3 hours. The biscuits currently come in 3 flavors: honey roasted, chocolate chip and strawberry. I liked the strawberry variety most because the bits of fruit reminded me of jam which adds a fun dimension. Most people that I had try each variety preferred the honey roasted flavor. 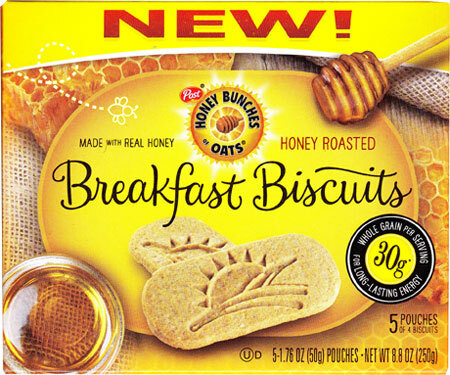 Those biscuits have distinct notes of honey in each bite and reminded people most of the Honey Bunches of Oats cereal the biscuits are named after. The chocolate chip variety was my least favorite on it's own, but interestingly, my very favorite when enjoyed with a cup of coffee. The chocolate doesn't necessarily taste artificial, it just doesn't taste chocolatey. But if you take a bite of biscuit and a swig of coffee together, the flavor wakes up and it reminded me a little of eating a chocolate chip scone. 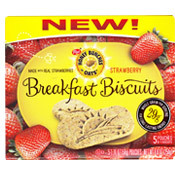 Bottom Line: If you're short on time, these breakfast biscuits can be a tasty lifesaver. They taste like cookies, because they basically are cookies. And who doesn't like cookies. Nutritional Considerations: Each 4 biscuit serving has 230 calories, 9 grams total fat, 5 mg cholesterol, about 35 grams total carbs, 4 grams dietary fiber and about 12 grams sugar. The $0.00 price amount reflects that samples of this product were sent to us by the company. 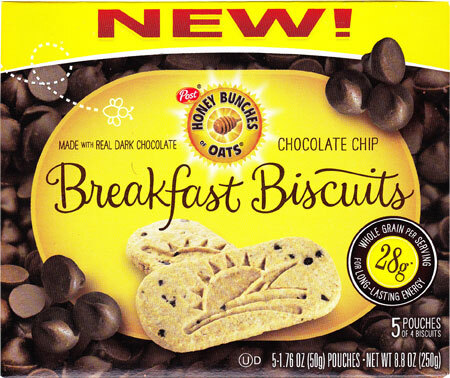 What do you think of HBoO Breakfast Biscuits? Chocolate chip version tastes great, but the store where I got them quit carrying them. Where can I find them? 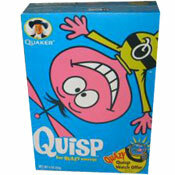 They where GREAT but I can't find them in stores anymore? !